编码： 9781597020190. 分类： Bestsellers, Children's Fiction. 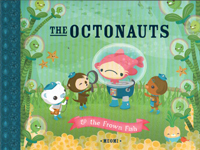 In their fourth adventure, the Octonauts travel to a large reef city where they discover this bustling destination has turned into a ghost town! The once colorful coral has turned an eerie white and homes lay empty. So the crew visit different reef ‘neighborhoods’ from mangrove forests to seagrass meadows, searching for clues. Can they solve the mystery of the great ghost reef?